6565 10bboZ Castle and palace stamp booklet with pressed fold on field 3 and 7, as well wide compensation perforation above, photo expertize Schmidl BPP. 6235 249Borken 30 Pfg. 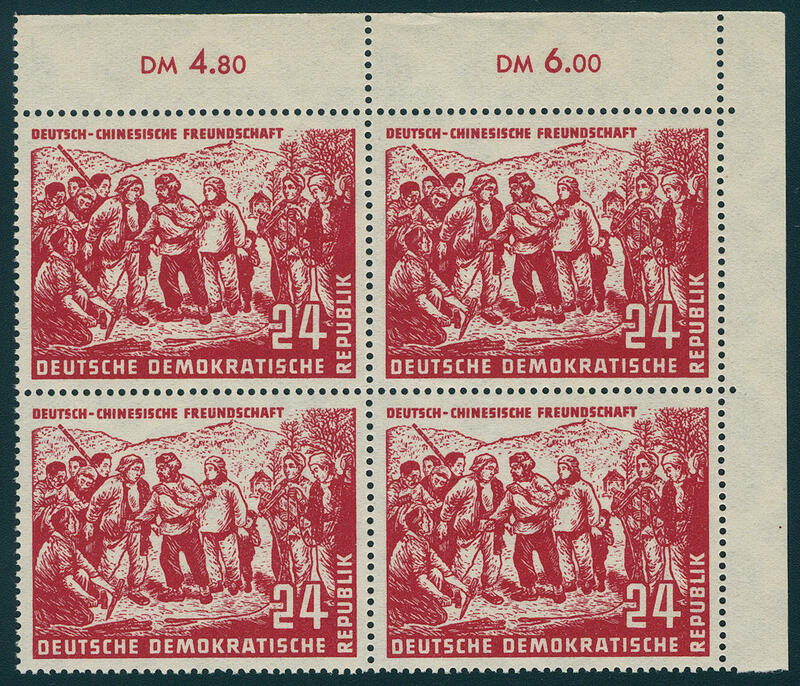 Leipzig spring fair 1950 with vertical spotted gum, fresh colors and very well perforated, in perfect condition mint never hinged a newfound German Demokratic Republik (East Germany) rarity, the also in the Michel special catalogue up to now unlisted is! Photo expertize \"the condition is perfect\" Mayer. 6236 / 252Abart 24 Pfg. 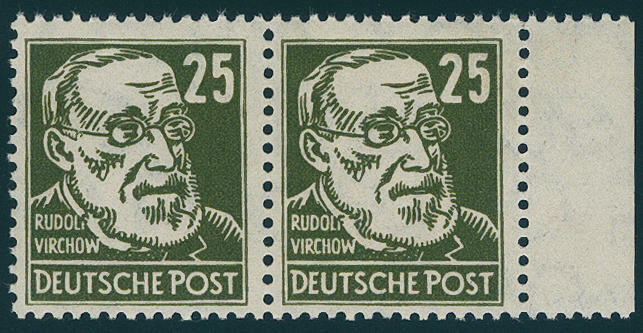 Pieck 1950, horizontal pair from lower margin with extremely strong displaced comb perforation, through it at the bottom \"unperforated\", in perfect condition mint never hinged, left stamp clean trace of a hinge. 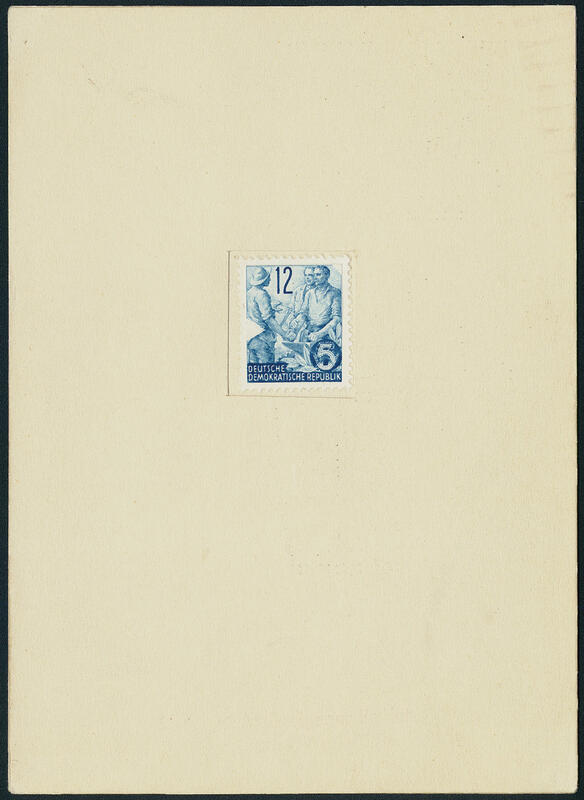 A very decorative and scarce variety! 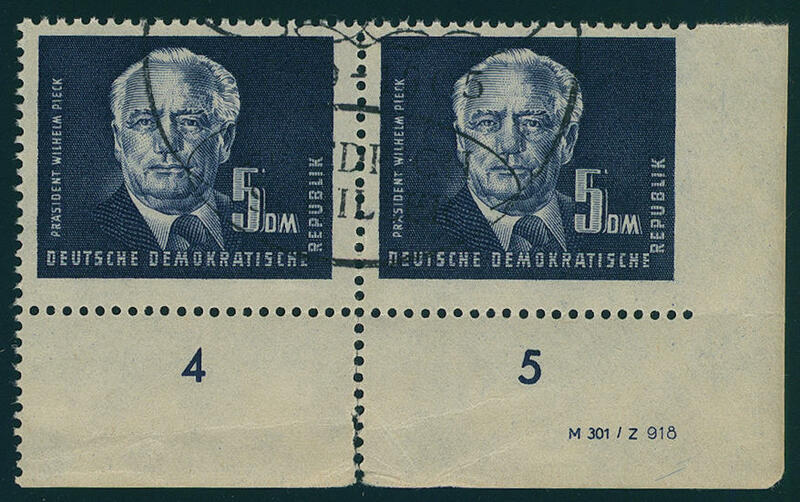 6237 ⊙ 255UrDV 5 DM Pieck 1951, horizontal pair from of the right lower corner of the sheet with printers mark, the right stamp with the extremely rarely variety \"right unperforated\", only in the margin of sheet small defects, otherwise in perfect condition. Already in normal form are only a few examples of this variety have become known. 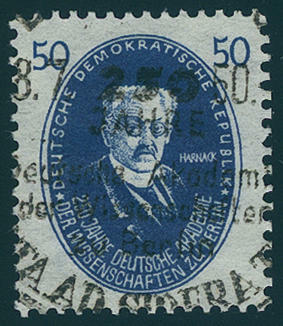 Associated with the printers mark probable unique! Photo expertize Mayer VP. 6238 261/70 Academy 1950, uniform from the left lower corner of the sheet, unfolded, in perfect condition mint never hinged a very nice set! 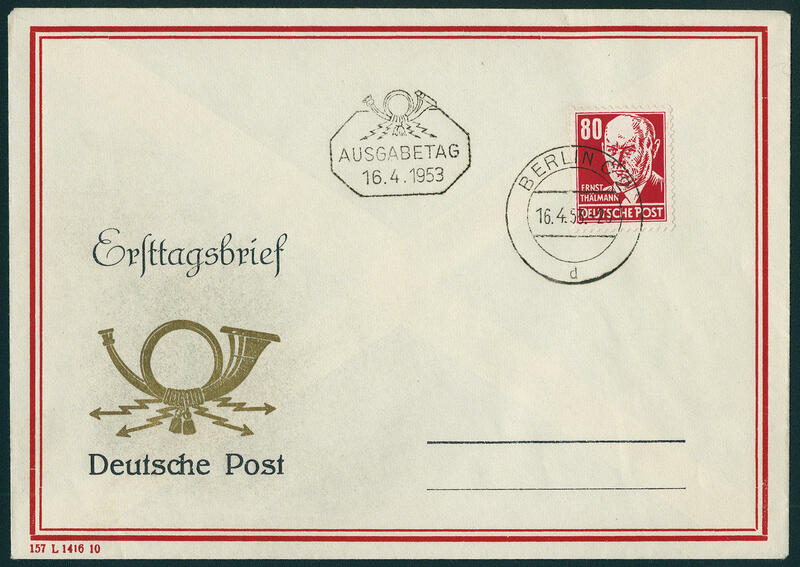 6239 ⊙ 261/70 Academy 1950, fresh colors and in perfect condition, especially nice uniform centric cancellation with appropriate special cancel \"BERLIN 18.7.50. \". 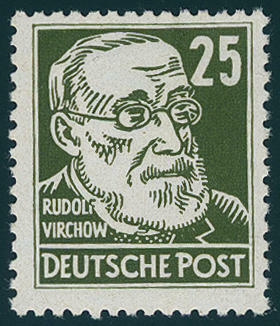 6240 287 24 Pfg. 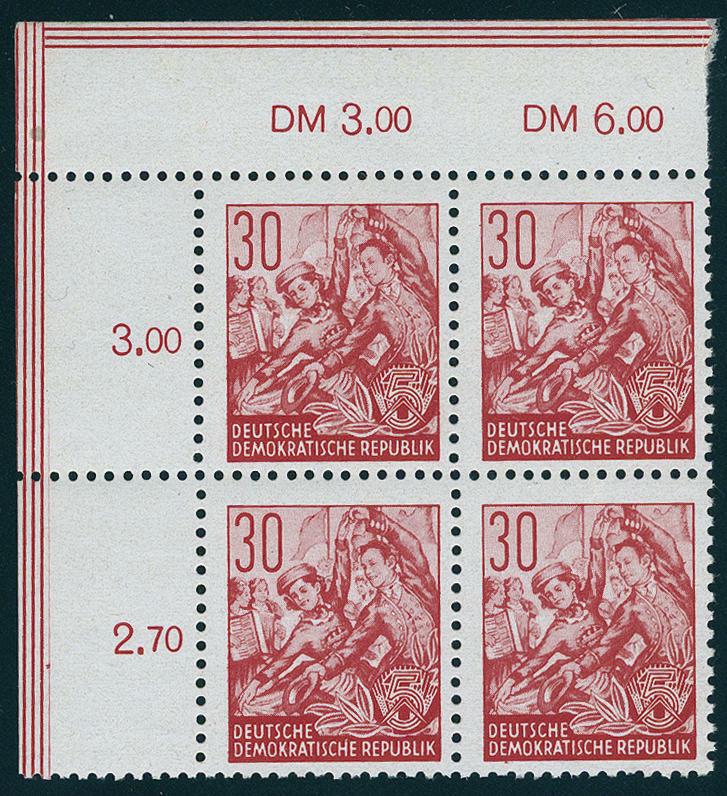 German Chinese friendship, block of four from of the right upper corner of the sheet, unfolded and in perfect condition mint never hinged Michel 520,- €. 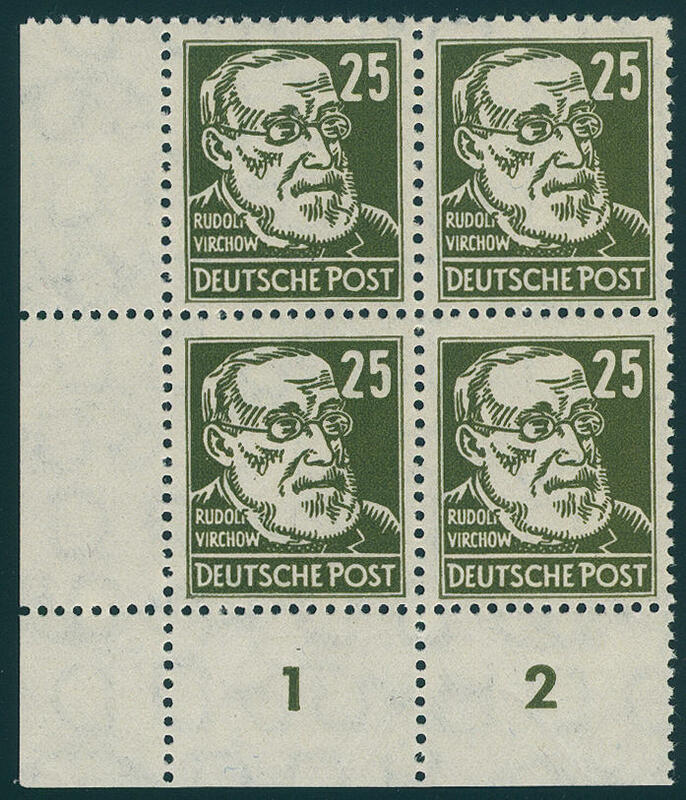 6241 334vaXI 25 Pfg. Heads watermarked 2 XI, chalky paper, from left margin of sheet, in perfect condition mint never hinged photo expertize \"mint never hinged perfect\" Schönherr. Michel 350,- €. 6242 334vaXI 25 Pfg. 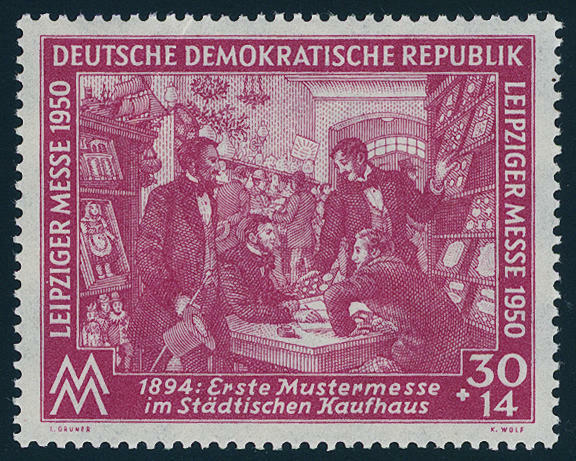 Heads, chalky paper, watermark 2 XI, fresh colors and in perfect condition mint never hinged, expertized Mayer BPP. Michel 350,- €. 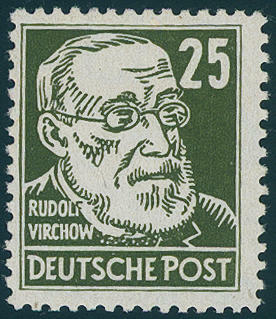 6243 334vaXI/PFII 25 Pfg. Personalities 1953 in good variety watermark 2 XI, chalky paper, with scarce plate flaw \"broken auricle\", fresh colors and in perfect condition mint never hinged, expertized Macudzinski, photo expertize \"perfect\" Paul BPP. Michel approximate 850,- €. 6244 334vaXII 25 Pfg. Heads, chalky paper, very rare watermark 2 XII, in perfect condition mint never hinged, hardly ever offered, photo expertize \"the condition is perfect\" Mayer. Michel 1000,- €. 6245 334zXI 25 Pfg. Heads, watermark 2 XI, ordinary paper, horizontal pair from right margin of sheet, fresh colors and in perfect condition mint never hinged, photo expertize \"the condition is perfect\" Mayer BPP. Michel 400,- €. 6246 334zXI-II 25 Pfg. 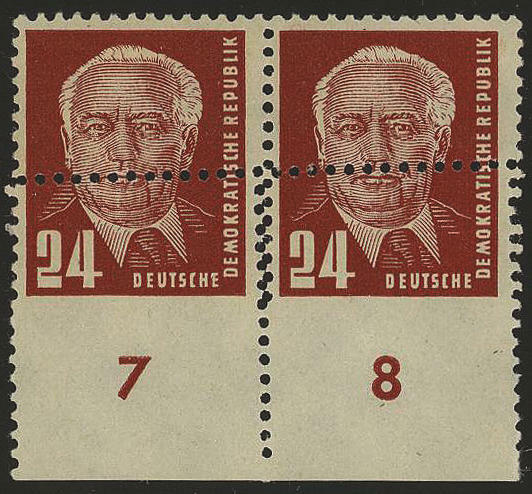 Heads, watermark 2 XI, ordinary paper, block of four from the left lower corner of the sheet, fresh colors, unfolded and in perfect condition mint never hinged as well the left upper stamp with good plate flaw \"broken UHRMUSCHEL\". A very nice and scarce unit! Michel 1100,- €. 6247 ∆ 339xbXI 80 Pfg. 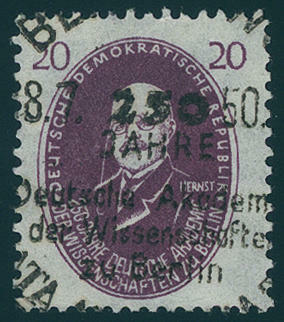 Thälmann, varnish paper, fresh colors and in perfect condition on parcel card coupon, clean and on self-formed pages \"LEIPZIG\" in perfect condition, expertized Müller, Weigelt BPP. Michel 1600,- €. 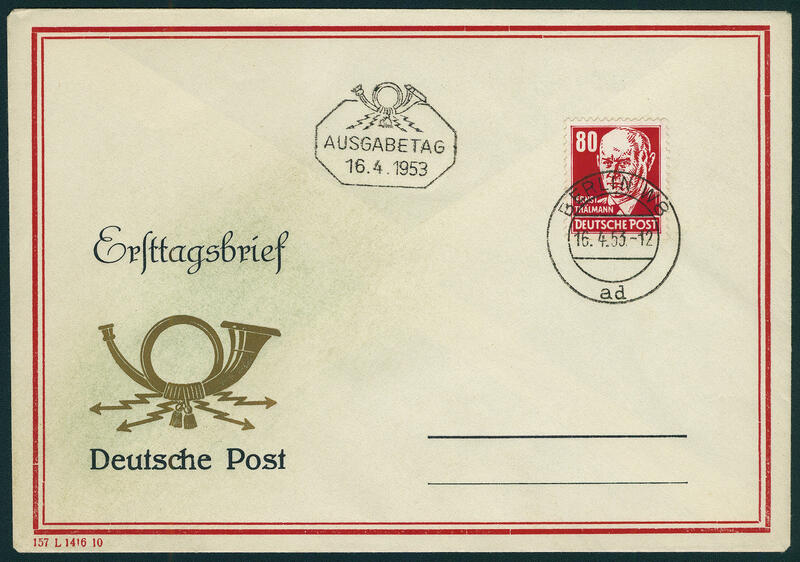 6248 FDC 340 80 Pfg. 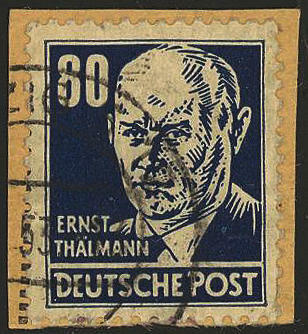 Thälmann on faultless illustrated First Day Cover from \"BERLIN 16.4.53. \". Michel 500,- €. 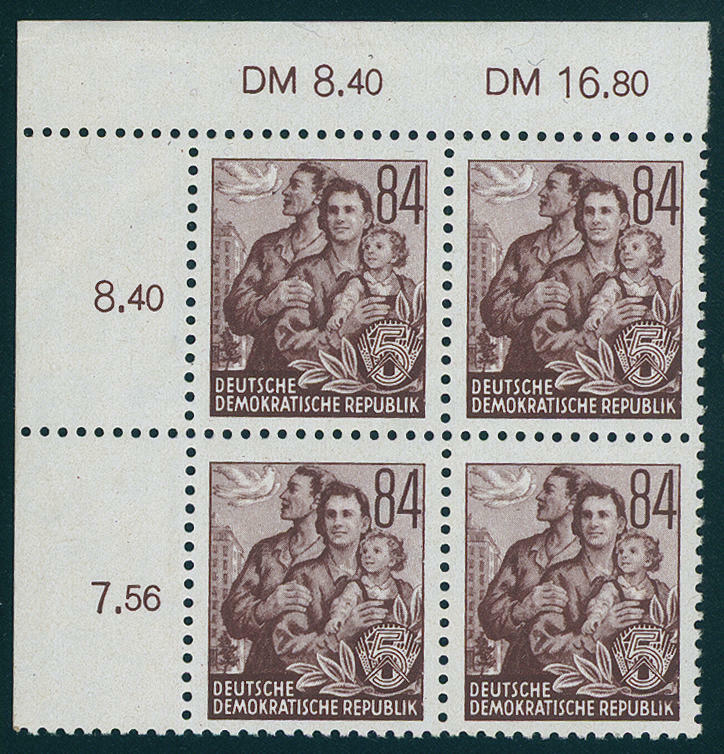 6250 362/79 Five year plan 1953, block of four set from the left upper corner (80 Pfg. 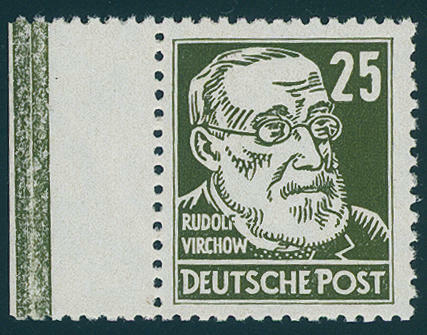 Lower left), fresh colors and in perfect condition mint never hinged Michel 600,- €. 6251 VK 367Probe 12 Pfg. 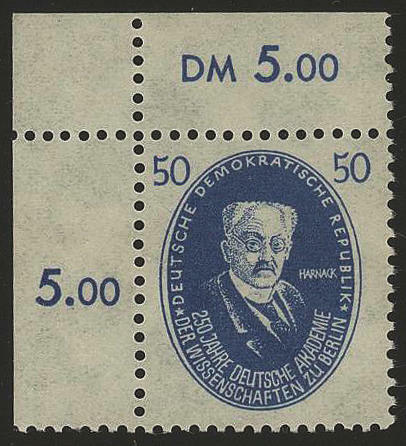 Five year plan 1953, proof in greenish-blue in lieu of medium blue on specimen cardboard of the printing plant \"nationalized and government controlled industries and businesses in the DDR graphic workshops LEIPZIG\". 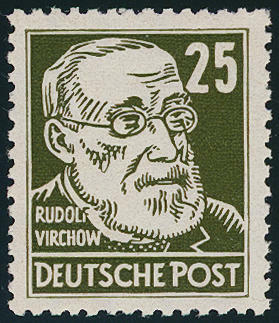 A spectacular GDR-rarity, there this specimen cardboard with the perforated proof in the Michel special catalogue unlisted is. Photo expertize Paul BPP. 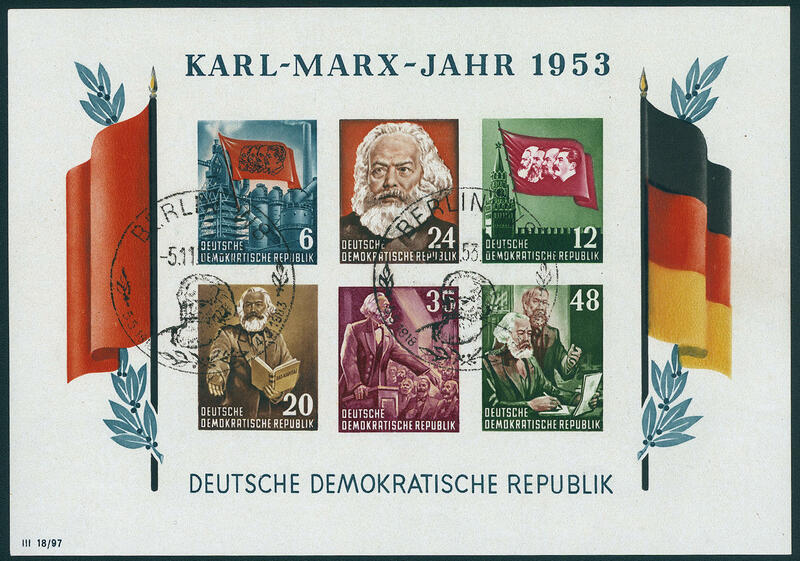 6252 ⊙ Bl.8/9A/B Karl Marx souvenir sheet 1953, all fours examples, in perfect condition with special cancellation \"BERLIN\". Michel 600,- €. 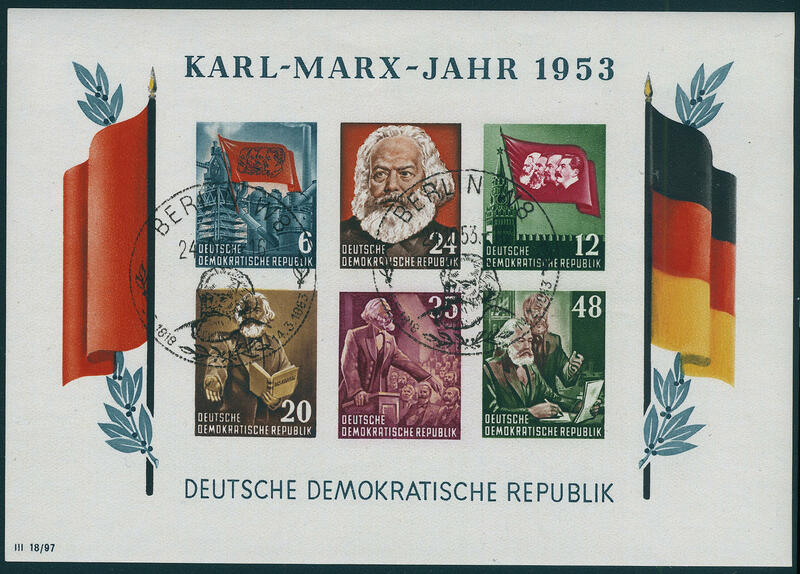 6253 ⊙ Bl.8/9A/B Marx souvenir sheet 1953, in perfect condition with appropriate special cancel \"BERLIN\". Michel 600,- €.